January 8, 1956. I was not yet born. But on that day, 5 young men, Jim Elliot, Nate Saint, Roger Youderian, Ed McCully and Peter Fleming, Americans, were speared on a sand bar in the Ecuadorian jungle. Life magazine sent a reporter and the January 30, 1956 issue published a 10-page photo essay on the discovery of the bodies. It was a story that influenced my life. Elisabeth Elliot, widow of Jim Elliot who died that day trying to make contact with this isolated tribe, wrote several books about the incident. There are many online links about the event. Fast forward to 1994. I, along with my husband and our three children, lived in Shell Mera, on the edge of the Ecuadorian jungle. 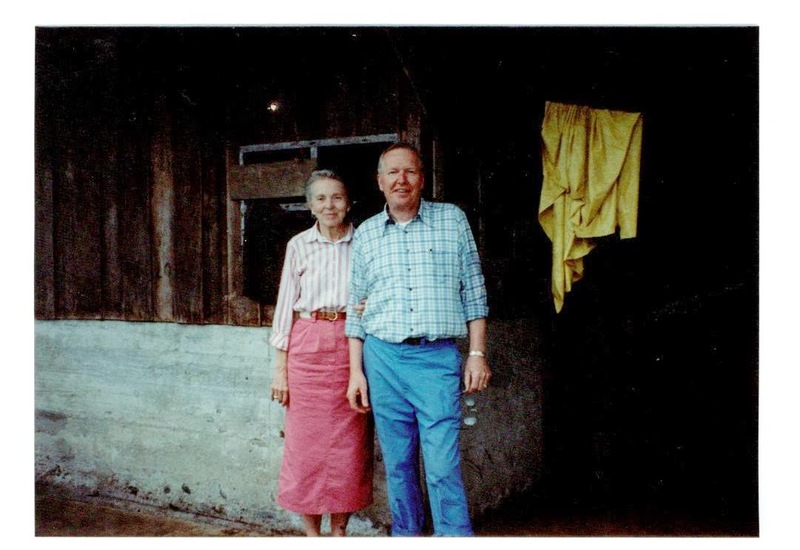 Elisabeth Elliot returned to the town of Shell with her 3rd husband, Lars Gren, with plans to visit Shandia, the village where she had lived until that event in 1956. Tim and I volunteered to drive them there. I didn't want to pass up an opportunity to spend time with Elisabeth. Her books had challenged me. Our family of 5, plus Elisabeth and Lars, and Elisabeth's former house helper, Antonia, (who, in 1994, worked in the hospital Tim administered), piled into our bright yellow van and jounced our way along pot-hole-filled roads, in the pouring rain, for several hours. Once at the village, we visited in several homes, drinking chicha (don't ask), waiting for the rain to stop. It didn't. Elisabeth finally said, "let's just get going." She took off her shoes, saying that she had always walked the jungle trails barefoot and saw no reason not to do so again. I kept mine on. Then up the slippery, muddy trail we went, rain pouring down, not in rivulets, but actual rivers, soaking us to the skin in spite of our umbrellas. The first photo shows Elisabeth and Lars in front of the house that Jim built. A local family lives there now, but graciously allowed us all to traipse through it. Elisabeth spoke of little memories in each room - "Jim loved to play with Valerie in front of this fireplace," "I had my desk in this corner and I gazed at this view while writing my first book," "here's where the radio was and where I was standing when I heard the news." 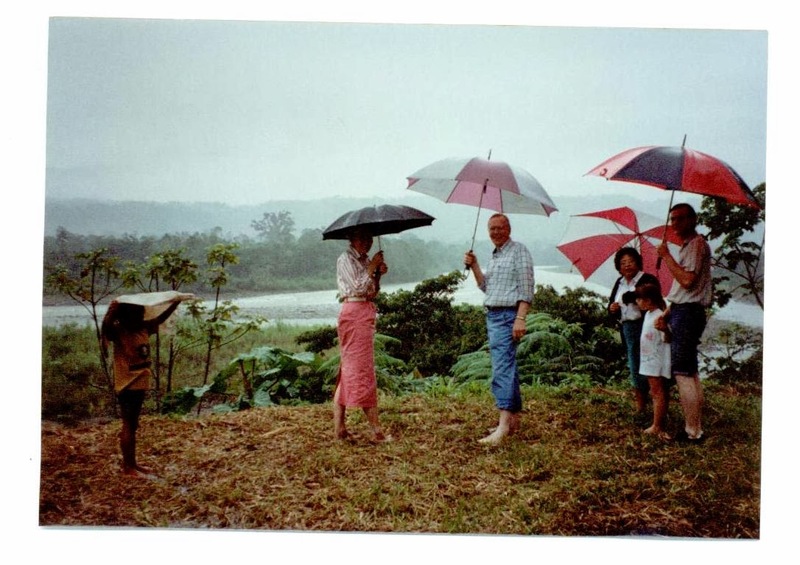 The second photo shows a young boy, Elisabeth and Lars, Antonia, Tim, and Ashley standing on a bank overlooking the Napo River. It was a story I'd read and heard of so many times, but I gained a new perspective that day - the perspective of a strong woman of faith who deeply grieved the loss of a beloved husband, and who wondered what the future held for her tiny orphaned daughter. Have you ever heard of this story from 1956? It made world wide news with the Life magazine coverage. I love Elisabeth Elliot. I have read several of her books and need to finish one, in fact. How special that you were able to have that time with her. I think she is a woman who has gained great wisdom in her walk with the Lord and am so thankful that she has shared her life and wisdom with us. Thank you Lorrie for sharing these memories with us. Yes, this event had a great impact on me. We heard Elizabeth speak at our church several years ago too. It's amazing to hear of what happened with the people of that village and the changes that took place. What a wonderful opportunity to meet this amazing lady. I was at school when I first heard of her. I think we had a missionary film or talk about the men, and I've never forgotten it. I actually remember this event quite well as it was a big deal at our house. My dad grew up with Nate Saint and brothers (across the street) and my aunts and uncles knew Jim at college. I remember pouring over the Life Magazine and the books that came after. I think there is a picture in one of them of Betty (as I knew her name growing up) sitting at that desk writing. It had a big impact on me and on the world of missions. Thanks for the reminder. Great photos! Oh yes. It has had a profound effect on many and on the Kingdom of God itself. I have never met Elisabeth, though I have had the honor of hearing her speak. What a special experience you had. Do you read the newsletters Lars writes? They are newsy and bright and even funny. I only just recently read the Christmas newsletter. Oh my Lorrie. What an honor for you to go on this visit with her. I've actually not read her books but my husband has listened to her? or people quoting her? on radio shows and he references her often. We saw a movie that I understood was about her and her husband but I'm not sure they used their names about 9 years ago or so. It was so moving. I've never been in a theater that quiet ever. When it was over, everyone just walked out in silence. Yes! I was blessed to meet and listen to Elisabeth at a camp I attended years ago in the foothills of the Cascade Mountains. I will always treasure that time. I love her teaching and writing; she is such a wise woman of faith! GREAT post Lorrie--I was just watching a film about Nate Saint the other night. Oh yes, I have heard of this story! It is quite a moving one too. I have read Elisabeth Elliot's Shadow of the Almighty and Through Gates of Splendor (and many of her other books as well). Through Gates of Splendor had a great impact on my son when he was in college. He still quotes from it. There is deep, rich inspiration in this story of five men who gave all to God. And their influence lives on. Thank you for sharing your encounter with Elisabeth and her husband! Oh how lucky you were to get to meet her and be a part of this meaningful moment in her life. I have always admired her. Her books always challenged me. They also influenced my decision to join the Peace Corps. My husband and I were stationed to serve in the area of Ghana, Africa but four months prior found out I was pregnant with our first child and then could not go. I just happened onto your blog tonight and am so glad I did. This stirs my own memories. As you know, I grew up with that story, singing "We Rest on Thee" for tour groups. Love that second picture. It looks like . . . Shell. I found your blog through MGCC. Though I don't read your posts regularly this one resonates with me as our son, his wife and 4 children live in Shell. I have a spot on our bookshelf reserved for books and videos I've collected over the years about the Jan. 8 event. You mention that your husband was the administrator of a hospital; I'm thinking it is the one where our 4 grands were born. Small world! I'm a reader from PA and my husband has relatives who have Saint neighbors. I've been inspired by Elisabeth Elliot and Steve Saint. How great is our God!! I was an adult before I started reading Through Gates of Splendor and other books about the missionaries, and eventually many of Elizabeth's writings. What a testimony and heritage! I love the part about her taking off her shoes. :-) Thank you for sharing these moments and memories.